Apple has shared a video on its YouTube channel showcasing the video recording capabilities of the new flagship iPhone XS, which debuted on Wednesday at Apple's Gather Round event held at Apple Park. 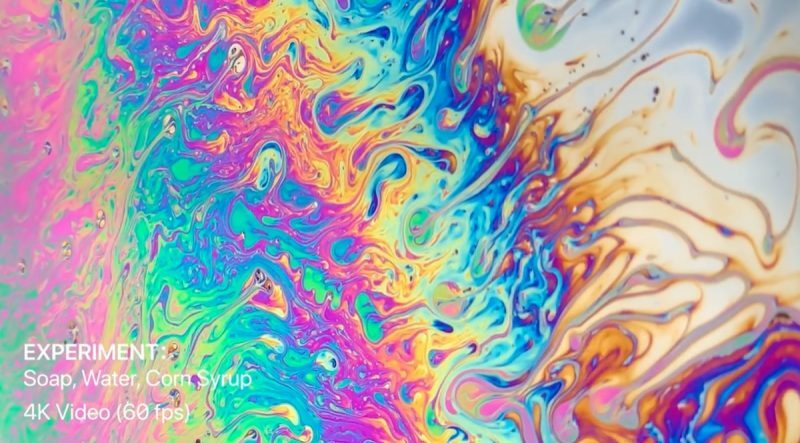 The content provides a "first-look" at video shot on the new device, which Apple claims has the "highest quality video shot on any smartphone", and looks at how water, metals, and other substances were used to create the impressive clips. Over 1 minute and 44 seconds, viewers get a sample of what the smartphone's 4K, Slo-mo, and Time-lapse modes can capture in close-quarters, interspersed with short clips of how the experimental conditions were set up. For example, one low-light experiment in 4K (at 60fps) mixes ink and clay over several glass panes to create a stunning interstellar-like scene complete with planets, their satellites, and nebulae looming in the background. Apple says the XS family features larger pixels and a faster sensor than previous iPhones, enabling improved low-light performance and video stabilization, while four built-in mics allow video to be recorded with stereo sound. The iPhone XS and iPhone XS Max come in 64GB, 256GB, and 512GB storage capacities, and in Space Gray, Silver, and Gold. The iPhone XS starts at $999 in 64GB, while the iPhone XS Max starts at $1,099 in 64GB. Pre-orders for the smartphones begin on Friday, September 14, ahead of launch on Friday, September 21 in more than 30 countries and territories. Is no one else going to point out the irony of a YouTube video by Apple boasting about 4k video that can't be watched in 4k on Apple's own web browser? These scenarios they shoot with the iPhone for promotion would look good shot with almost anything, even a 5 year old smartphone. I was recording some videos in a club this last Saturday with my X and got a load of grain. I was recording the visuals of the projectors. Never as good as this video, never the quality advertised. Steve would've never allowed showing behind the scenes process. Don't you people ever get tired of telling every one what steve would and would not have liked or done? Truth is NONE of you have a flipping clue. You might want to consider and evaluate your technique, along with the conditions of the environment in which you're shooting. That's no different than someone inexperienced purchasing an expensive dSLR, and then complaining that the photos they make are not as good as those shot by someone with years of experience. Finally gets long overdue stereo recording. And thankfully he's not around to keep us from seeing it. Nice video and it is really funny to shot 4K videos on a 64GB smartphone. I'm ok with 64 being the base model on the Xr but since Xs is $250 more 128GB as the first tier would have been appreciated. Then get the 256gb or 512gb option. They conveniently forget to mention that the Xr can also record 4K video at 60fps for $250 less that the Xs.